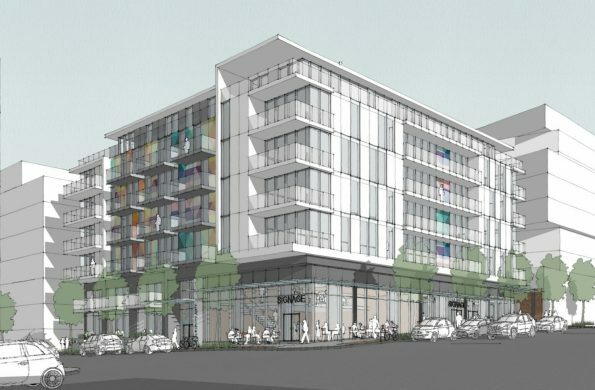 Developer PortLiving is proposing a six-storey condominium building with retail space at Main and East 6th Avenue in Mount Pleasant. The site is home to a small building which was most recently home to the Hot Art Wet City art gallery. The gallery’s lease ended in March 2017. Bluestar Motors was also located on the south side of the site. 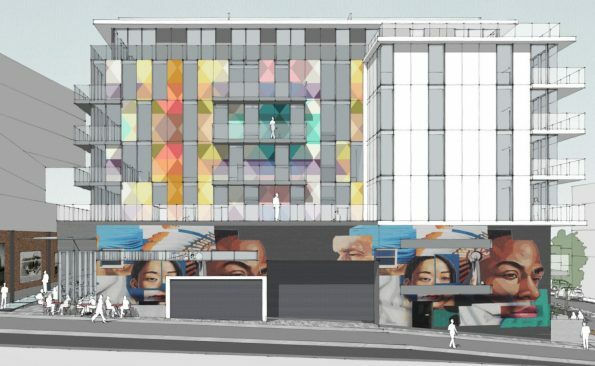 Architects Studio B Architecture and PortLiving are proposing a new development, tentatively named Main Street Arts, with 65 strata condominium units; and 9,174 sq ft. of retail space plus 6,617 sq ft. of retail space below grade. There will be 69 residential parking stalls, plus 30 for the retail space. An open house will be held on December 11, 2017 from 5:00 p.m.-7:00 p.m., at St. Partick’s Parish Church (2881 Main Street) with city staff and the applicant present.